Together with shutter speed and ISO, the aperture setting on your camera is one of the three fundamental elements of exposure. Not only that, but aperture plays an important part in the look and feel of your images, so it's important to get to grips with it. We'll look at the aesthetics shortly, but first let's explore how aperture affects exposure. Just like the pupil of your eye, which opens and closes to control the amount of light hitting your retina, the role of a camera's aperture is to control how much light reaches the sensor. All lenses feature apertures, and the size of the aperture can be set by you, controlling how much or how little light passes through the opening. Why would you want to control the amount of light hitting the sensor? To understand this, we need to take a quick look at the second element that plays a part in the correct exposure of your shot: shutter speed. Shutter speed relates to how long the camera sensor is exposed to the light that passes through the aperture, and because this can be anything from a brief as 1/8000 sec to over 30 seconds, it also dictates how movement is captured. So, provided the light remains the same and you increase the shutter speed, you're shortening the exposure time. To avoid underexposing your shot to compensate for this reduction in exposure time, you'll need to increase the opening of the aperture to let in more light for a correct exposure. Likewise, should you want to extend the shutter speed – for example to blur your subject creatively – you'll need to limit the light reaching to the sensor to avoid overexposing the shot. 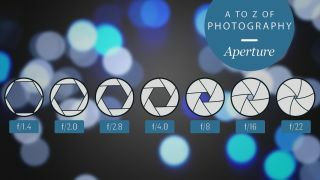 To do this, you'll need to make the aperture smaller. It's a question of balancing these two elements to get the correct exposure. However, it's not always possible to achieve this in some light conditions, which is where ISO comes in. ISO dictates how sensitive your camera's sensor is to light, and increasing the sensitivity means you can use a faster shutter speed without risking underexposing the shot. The aperture setting is measured in f-stop values, with apertures such as f/1.4 and f/2.8 often referred to as 'wide' apertures, as they have the widest opening and let in the most light, while apertures with higher f-stop numbers (f/11, f/16 and so on) are (perhaps rather confusingly) referred as small, or narrow, apertures as they offer the smallest openings. You'll also probably hear photographers say they're 'stopping down' a lens when selecting a small aperture. Just to confuse things a little, lenses don't have the same aperture ranges, with some offering wider apertures than others, while others will have smaller f-stop numbers. While the minimum aperture available isn't so much of an issue for photographers, the maximum one is. This is because the more light a lens can let in, the greater flexibility you have as a photographer, allowing you to use faster shutter speeds when light levels are low, as well as harnessing the creative benefits this brings – of which more shortly. The maximum aperture is noted in the lens – for instance, a Nikon AF-S 85mm f/1.8G sports a maximum aperture of f/1.8, while a Canon EF 16-35mm f/4L IS USM features a maximum aperture of f/4. Why don't all lenses then have a maximum aperture of f/1.8 or f/1.4? It comes down to physics and cost. For example, as well as the AF-S 85mm f/1.8G, Nikon also produces a AF-S 85mm f/1.4G, and while there are other differences between the two optics, the larger lens elements required for the f/1.4 version means the price is almost triple that of the f/1.8 version. Some zoom lenses have what's known as a variable maximum aperture – they have a different maximum aperture at one end of the zoom range to the other. The Canon EF-S 18-55mm f/4-5.6 IS STM, for example, has a maximum aperture of f/4 at 18mm and f/5.6 at 55mm. In the main, variable maximum aperture zoom lenses are a bit of a compromise; they tend to have smaller maximum apertures than zoom lenses with a constant maximum aperture, but the pay-off is that these lenses are often quite a bit lighter and cheaper. You'll often hear photographers refer to lenses either being 'slow' or 'fast'. This doesn't refer to the focusing speed, but to the maximum aperture available – a lens with a maximum aperture anything wider than f/2.8 is referred to a 'fast', while others are referred to as 'slow'. This is because they don't let in as much light, so exposures require a slower shutter speed. The size of the aperture also enables you to control the depth of field in an image, and is one of the key creative tricks up a photographer's sleeve. This easy way to think of depth of field is as the area extending in front of and behind the point of focus in which elements still appear acceptably sharp. By controlling this zone of sharpness, you can select which areas of an image are sharp, and which are blurred or defocused. In most landscape shots, for example you'll want to extend this zone of sharpness right from the front of the image to the back, while a portrait will benefit from a dramatically reduced depth of field, allowing you to isolate your subject from their background and conceal elements that might otherwise prove distracting. Both focusing distance and the focal length of the lens can play their part on depth of field, but which aperture you select is perhaps the biggest consideration when it comes to controlling this zone of focus. In essence, the wider the aperture you use, the less depth of field you capture, while the further you stop the lens down with a smaller aperture, the more depth of field you capture. In other words, if you want to blur the background, you'll want to use a fast aperture like f/1.8 or f/2.8, while for images that appear sharp from the front to the back of the frame you'll want to use a small aperture such as f/11 or f/16.